Welcome to this website which provides information and cleaning advice for all indoor bowls clubs and those outdoor clubs with an artificial playing surface. Over the last 7 years I have visited over half of the clubs in the UK to advise on green cleaning and as a result I have now supplied over 200 Proweave Sportsvac’s, with many more being shipped overseas to the bowls playing world. On my travels I have seen at first hand the ageing effect and damage caused by lack of care given to the bowling surface, which ultimately of course leads to the premature replacement of the carpet. During this period I have seen unsightly stains which in some cases have been made worse by enthusiastic club officials, who with good intent have only made matters worse either by not having the the right products, equipment or simply know how in how to tackle the problem. Simon Davies the Managing Director of Proweave Cleaning Systems Ltd has worked in the industrial cleaning sector for forty plus years. Initially selling equipment all over the world for one of the UK major manufacturers of cleaning equipment before subsequently setting up his own business in 1987. In 2014 he sold this business in order to spend more time with the family and to set up this new company concentrating on the bowls market sector thus accomodating both business and pleasure. Simon has been playing bowls since the age of sixteen at Welford on Avon Bowls Club in Warwickshire (www.welfordbowlsclub.com ) which has both a six rink outdoor and indoor green. 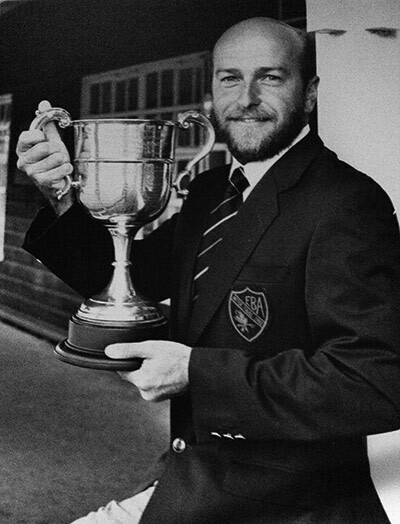 He has represented Warwickshire over four decades playing over a 100 Middleton Cup matches and had several England trials back in the late eighties. He is currently Chairman and Competition Secretary of the Outdoor Section and also one of the Club Directors. "My interest in the cleaning of bowling greens started at my own club when we built a six rink indoor facility in 1996. The bowling surface, underlay and board base we chose was from Dales Sports Ltd, who although at this stage a relatively new company on the bowls scene, offered us the complete hands on package. At this point in time the manufacturers felt that the best way of cleaning the bowling surface was using a twin or triple motored industrial vacuum cleaner with a fixed dusting brush as the risk of picking up a loose carpet thread with a vacuum cleaner with a brush roll was simply too great. The problem with this type of machine was that it relied on suction capability alone, was heavy and hard to push as the front brush met resistance from the carpet itself. Whilst it took quite a bit of dust out the carpet it seldom picked up hair and white bits of tissue or clothing threads which were a constant frustration for the operator of the vacuum when endeavouring to clean the carpet. With the knowledge gained from working within the cleaning industry this type of machine was never particularly effective on carpets and especially on a bowls carpet which is very open weave, however with the restrictions placed upon us by the carpet manufactures it was the only way forward at that time. From about 2010 the now common practice of heat sealing the ends of the carpet after stretching was introduced, thus removing the risk of loose threads and opening the door for an industrial brush roll type machine. Dales Sports Ltd were quick to appreciate the benefits of this machine and have purchased several over the years either for use with their cleaning teams or to through me to other bowls clubs'. This website will be updated with new developments and in some respects is a continual work in progress. I would therefore, appreciate feedback from clubs whether they found the information useful and if they have a particular problem relating to the carpet, then please feel free to contact me.